If you can dream it… We can build it! As Arizona custom home builders, at Woodridge Custom Builders LLC the position of the house as it relates the sun has always been an important consideration. In Arizona, north or south exposures have always been the most desirable direction for a house as it sits on a lot. In some subdivisions, the lots with north or south exposures are offered at a premium to east or west facing lots. In some well-planned subdivisions, nearly all of the vacant lots have north and south exposures. There is usually a main vehicular artery in the neighborhood that prohibits this completely, but as many lots as possible are created with north or south exposures. In other parts of the country this may not be as important as in Arizona. Outlined below are five common strategies for minimizing western sun exposures in Arizona custom homes. There is something totally unique about Arizona custom homes. The homes in Arizona are not like any other part of the country. Some may say, “Santa Fe”. Perhaps, though many of the homes in Santa Fe are true to the Mission or Territorial architectural styles. 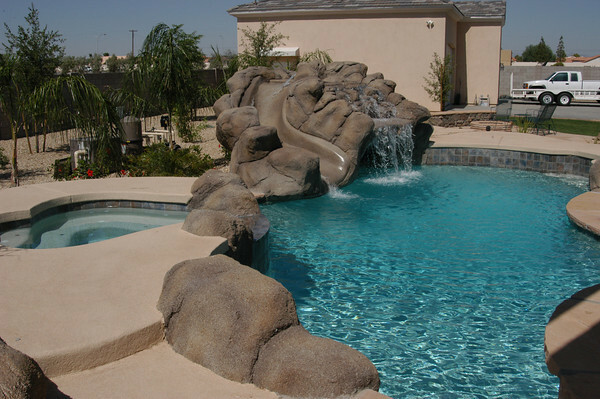 As a custom home builder, California actually serves are a great inspiration source for our Arizona custom homes. It isn’t the inspiration of new homes in northern San Diego, but sometimes it’s the old, but true classics found in San Marino and Pasadena. The old Spanish influenced homes with fully arched windows, white smooth stucco, red terra cotta roofs and big heavily carved wood doors, this architecture still inspires Arizona custom homes. Spanish Colonial makes one think of Billy Wilder’s film, Double Indemnity as Fred MacMurray approaches such a house to renew an insurance policy only to find a dangerous and sultry Barbara Stanwyck. Watch the first minute or so of the clip to get the feel of the Spanish Colonial as Fred MacMurry approaches the front door. . Ever strong in Arizona custom homes is the split floor plan. The split floor plan is not limited to high-end custom homes. It is a very popular floor plan for homes of any size. Simply, this floor plan places the master bedroom on one side of the house. The secondary bedrooms are located on the opposite side of the house. The family room, kitchen and public rooms of the house are placed between the bedrooms in the center of the house. This sets the master bedroom apart from the rest of the house helping achieve the master retreat feel. The floor plan may not work for everyone, but for families with teenagers it works out great. Loud music or slumber party laughter doesn’t usually travel to the master retreat on the other side of a house. It is sometimes referred to as the Mother-in-Law floor plan. This floor plan works with any home style from Santa Barbara, Tuscan, Spanish Colonial to traditional ranch. The attached floor plan is an example of a split floor plan. The master retreat is on one side of the house and the secondary bedrooms are on the other side of the house. The master retreat has a guest bedroom on the same side of the house. In this plan, the guest bedroom includes two entrances, one from within the house and a private exterior door located under the covered loggia. This floor plan can be modified if the entrance within the house is not desired creating more privacy for the guest quarters as well as the master retreat. As custom home builders in Arizona, at Woodridge Custom Builders LLC, we stay abreast of changes in floor plans, home styles and various amenities. We built our first split floor plan in 1990, yet this plan had been popular in Arizona long before that. This is a floor plan that has staying power and offers a custom home buyer good resale value. THINKING OF A CUSTOM HOME? WHAT’S YOUR FIRST STEP? Many potential customers at Woodridge Custom Builders LLC often ask us how to get started when thinking of a custom home. First, there is not really a right or wrong way to get started. Some of our customers find us after they have purchased the land or lot for the home, others want our help in this area. Some are referred to us by previous customers. Some are referred to us through our network of architects and home designers as they work on their house plans. Outlined below is an overview of the custom home building process. Detailed construction steps are not included here. Planning and Preparation: At Woodridge Custom Builders LLC, we believe that each project is an investment for our customers therefore each home we build is a signature of our work. A fantastic benefit of building custom homes is helping our customers realize your desires for your dream home. Each one of our customers has unique lifestyle preferences and we take great pride working closely with you to create a home where you and your family can enjoy your personal lifestyle. Home Site Selection: If you don’t already have a lot for your custom home, we can help you find the ideal location for your dream home. 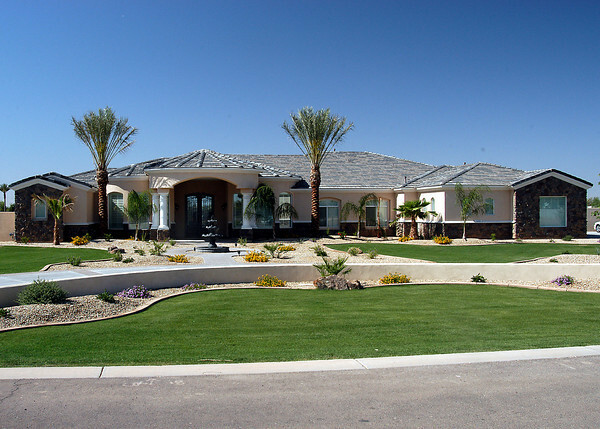 We are familiar with many of the prominent custom home communities in Scottsdale, Fountain Hills, Chandler, Rio Verde, Cave Creek, Tempe, and Carefree. We’ll need to find out if you want the natural beauty of our Arizona desert landscaping, the greens of a golf course or mountain views. What size of a custom home would interest you? What architectural style interests you? Once we understand exactly where your interests lie, we can focus our attention on an ideal neighborhood for you and family. Floor Plans and Illustrations: When the lot is selected, we partner with you and your architect or home designer to help design a home that will fit your family’s unique needs. We begin working on a set of house plans designed for your lot. With your lot selected, we can design the house for maximum views, best layout for minimizing western exposures and maximizing north and south exposures. The home designer will want to know what home style you prefer, Tuscan, Santa Barbara, Andalusian, Spanish Colonial, Hacienda, or contemporary. This is the first time your vision is transferred to paper. We encourage you to bring in a collection of photos, magazine clippings, preliminary designs, a rough floor plan and any other visual tool helping transfer your ideas to a floor plan, elevations, and illustrations. Materials: While the floor plan is formalized, we can begin working on the home’s materials and details. Exterior stone, exterior color, stain colors, gates, wrought iron accents, formal entry door, driveway materials, exterior fireplace and grill locations must be made. Then we’ll ask you to make similar selections for the interior of the house including cabinet style, counter surfaces, flooring materials, door style, door hardware, plumbing fixtures and lighting fixtures among other selections. You will work with our suppliers and visit showrooms to make these selections. For example, if you choose granite materials, you will actually walk the warehouse and select your own slabs of granite. Once the floor plan, elevation and materials are selected, each can be submitted to your design review committee for approval. Bidding Process: When you have made the many selections for your home, we can begin the bidding process. We bid competitively each and every project to get you the best possible price for your home. Our tradesmen are proven and talented contractors that understand we bid each and every job. We will discuss and contemplate the cost and efficiencies of different designs, structural features, and material selections. We believe its better for you to take your time making material selections and receive an accurate bid based on these selections, than get a rough estimate up front. When working with our suppliers and showroom professionals they can assist you with selections that keep your budget in mind. Permitting: During the design review committee approval process, all required documents are professionally gathered and submitted to the city for permitting. The length of this permitting process varies per city but can take anywhere from two to eight weeks. During this time we will walk through the plan together on paper and specifically review the materials you have selected and mark the specific location of these materials on the plan. Construction: After proper planning, design review approval and city approval we can break ground. There are various phases of construction beginning with site preparation, the foundation, the vertical stage, the roof dry-in phase, the rough mechanical and rough electrical phase, insulation, lathe, stucco, drywall and trim stage, interior finish stage, cabinets and interior trim detail, finish electrical, plumbing, and mechanical stage, flooring stage, and finally a finish and final clean phase. Progress: During the construction process, you’re welcome to visit the jobsite and see the progress on your home. During several phases of construction you’ll be asked to re-evaluate or confirm your selections for the location of telephone outlets, light switches, soap dishes, and other details that had only been done on paper before. As much as possible we keep our jobsites as clean and free of debris as possible, yet during major construction activities this can be difficult, since your safety is our concern, we encourage you to walk the jobsite with the project manager. If your having your home built while you live elsewhere, you can have private access within our website where photos and updates of your home’s construction will be posted. Inspections: Throughout the construction process, your home will go through various inspections by the city to assure that your home is built consistent with the required building codes. At Woodridge Custom Builders LLC, we are proud to offer our customers additional inspections throughout the home building process by an independent inspector. We are proud of our work and welcome an independent inspector on the job to keep our subcontractors as judicious in quality as we are. Our customers appreciate the openness with which we encourage an independent inspector. Final Approval: Once the city has approved the completed project and issued a certificate of occupancy, you’re closer to moving in. Before taking possession we will walk through the home and identify any items that need correction before moving day. You will receive a warranty booklet and directions on maintenance of the new products in your home. When all the punch list of items has been addressed, moving day has arrived. Your Custom Home: You deserve a custom-designed and built home that will bring your family years of enjoyment. Your home is unique for your character and lifestyle preferences, it is a place to be proud of especially because or your own influences from the design and layout, to material selections, to the finishing touches. It is your dream home! BUILDING AN ARIZONA CUSTOM HOME… SHOULD IT INCLUDE RV STORAGE? Where is the RV Storage? For owners of recreational vehicles, (RV) storage is an important issue. For RV owners, storage is as important as its use. Many Homeowners’ Associations (HOA) in place today prohibit RV storage on a homeowner’s property for more than a couple of days, unless enclosed in a garage. A standard car garage isn’t remotely close to the size required by most recreational vehicles. Storing an RV off-site becomes a necessity without a property large enough for enclosed storage in an HOA regulated area. If one is fortunate enough to live in an area that is not regulated by an HOA, you may be able to store the RV in the driveway or side yard area, but this doesn’t mean your neighbors like it. Storing an RV off-site is typically an inconvenience when preparing for a trip, and unpacking from a trip. Most RV owners would agree that the ease of loading and unloading for a vacation, camping trip, or other adventure is much more convenient when it can be done at home over a few days without rushing to get the RV off the property before the HOA jumps down your throat. Storing an RV off-site at a local storage company may cost anywhere from $30 to $90 a month depending on where you live. At Woodridge Custom Builders LLC, as custom home builders some of our customers have experienced these RV storage issues. If at all possible, RV storage was constructed with their custom home if the lot was large enough and allowed by their HOA. Aside from the difficulty with adequate RV storage space on the lot, incorporating such a large garage into the architecture of a house that meets with HOA approval is sometimes challenging. In many custom homes subdivisions, all garages must have side-entries. Difficult for a large RV, a lot must be extremely large to allow for any kind of side-entry. RV garages must be higher than a standard car garage and this too can create an architectural challenge. Most HOAs will not approve a custom home design and floor plan if the RV garage is an unsightly large box better fitting in an industrial park than a residential custom home neighborhood. For custom home buyers interested in incorporating RV storage with the construction of their custom home, a well-planned home design and floor plan can save time later with HOA and city code approvals. Waiting to construct an RV storage garage until after the home is completed is not recommended unless it has been initially incorporated into the house plans. In most municipalities, homes constructed on residential lots are permitted to cover a certain percentage of the lot. Failing to let the architect know that an RV storage garage is planned for later, the architect may design the house and standard garages without leaving enough room for RV storage as required by designated zoning. Exceeding lot coverage may require a variance by the municipality and approval by neighbors prior to construction. At first glance it doesn’t seem as though the custom home in the photo below includes an RV storage area. In fact, this large lot included RV storage in the back of the home. As shown in the second photo, although large enough for a 36 foot RV, this garage is located in the back of the house and not overbearing and overpowering to the architecture of the house. Floorplans Designed with Kids in Mind! Designing a custom for home for exactly how a family plans to use the home is one of the most rewarding benefits of building custom homes. Many families that have the opportunity to design and build their dream home; do just that. The floor plans selected or created can be very specific to a family’s needs. One of the great features recently included in custom homes is the ‘kid zone’. The ‘kids zone’ is not necessarily a playroom, although it can be for very young children, but an area of the house where kids can have a television, use computers in a supervised area, play video related game, and just hang out with their friends. At Woodridge Custom BuildersLLC we have built these kid friendly areas adjacent to the children’s bedrooms using the popular split floor plan. It is very popular in Arizona to build a house with a split floor plan, this means that the master suite is located on one side of the home, while secondary bedrooms such as children’s rooms or guest rooms are built on the other side of the home. Having the children’s bedrooms on one side of the house and designing a separate playroom or children’s family room near their bedrooms, offers a terrific way for kids to play video games, watch television, play loud music, play on a computer or just hang out with friends without isolating themselves in their bedroom. Depending on the age of the children, these rooms can evolve as a child grows. These rooms can begin with the Little Tyke type toys, walkers, kitchen sets, tents and other large toys familiar to parents of very young children. As the children grow, the room transitions to an area where kids can hang out after school with friends, and play video games for example. When things settle down for the day it can be a great study or reading area. Eventually when the kids move out, it may be possible to convert this area to a home theatre, craft room, work-out room, or other area just for the parents. At Woodridge Custom BuildersLLC we have seen these kid zones become much more popular, not only popular, but much more useful and lived-in areas of a custom home. Initially, we used to see these kid areas located adjacent to the kitchen as study areas for kids. Honestly, some of those areas just became cluttered cubicles for the kids to throw their stuff when they got home from school. This newer trend to have a designated children’s area adjacent to the secondary bedrooms seems to be much more kid-friendly and useful living space. Outdoor furniture has gone through a revolution in the past few years. Outdated is the PVC furniture and vinyl strap seating. Frosted glass patio tabletops now have a certain “retro” look. Not only has outdoor furniture changed in the past several years, outdoor spaces have evolved beyond dining patios and poolside lounging areas. Welcome are seating arrangements that are not just designed for outside dining, but outside living. Many popular outdoor furnishings include sofas, oversized chairs, end tables and cocktail tables designed for comfort and relaxation. Add large potted plants, accent pillows, area rugs, and outdoor lighting and a patio suddenly becomes a true outdoor living area. At Woodridge Custom Builders LLC, helping a customer design and build a custom home doesn’t end with the house and the interior elements. The outside of the home, its courtyards, patios, yard and landscape are all design elements that pull the custom home project together in the end. It is important to know how an outdoor space will be used. Will the family primarily use the space for private family gatherings? Will the patio be used to host barbecues and neighborhood gatherings? How much dining area will be necessary for its intended purpose? Is there an area where a luxurious seating arrangement can be established, covered and protected from the harsh Arizona sun and elements? There are many other questions to ask regarding patio lighting, ceiling fans, music systems, and camera systems over the pool area, for example. Whatever a custom home buyer selects for their patio, courtyard, backyard or outdoor living space, planning for the space is best done during the house plan and home design stage. How wide should a patio extend from the house? Should it be completely covered, or should some of the patio extend past the roofline of the house? These are all questions a custom home buyer might ask in the planning phase of their custom home. Decisions made in the floor plan stage of a custom home truly pay off in the end. Enjoying the family pool, lounging on an outdoor sofa, sitting back appreciating a mountain view, or sitting quietly reading the newspaper with a morning cup of joe; planning pays off. In the first set of photos, this custom home owner designed the back yard with kids in mind. The pool area is great for pool parties. The trampoline in the back of the yard has been built into the ground to minimize fall injuries. Most fall injuries occur from falling from one level to another, in this case the trampoline is flush with the ground. The yard is large enough for activities so when the kids are not in the pool, or on the trampoline, setting up the lacrosse cage for a little one-on-one, or a game of volleyball are always other options. In the second set of photos, this custom homeowner designed the patio area as a relaxing outdoor living area. Outdoor sofa, love seat, and a side chair just beckon one to settle in and relax. The end tables and cocktail table accented with candles, plants and accessories further enhances the feel of outdoor living. Cllick on each photo below to enlarge. THREE POPULAR INTERIOR TRIM STYLES IN ARIZONA CUSTOM HOMES!